This book is the first of its kind to address the treatment of men in marital and family therapy from a political or feminist perspective. Feminist Approaches for Men in Family Therapy is an important and provocative addition to the field of family therapy and psychotherapy and works to deepen the understanding of men by using more traditional approaches. 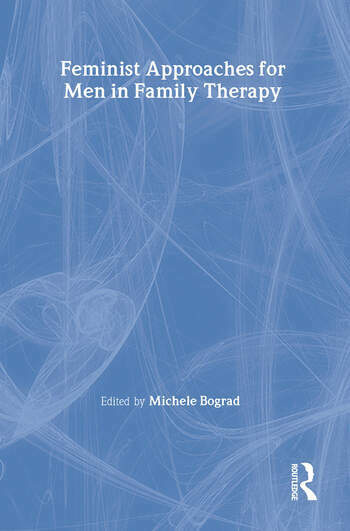 Timely and relevant to today’s interest in men’s issues, this book develops and demonstrates applications of treatment methods in straightforward prose from a variety of family therapy models. These techniques and methods enable anyone working with men--beginning and advanced clinicians, regardless of clinical preference or loyalty--to have a more effective practice with men. Truly reflecting its title, this provocative volume offers new ways of conceptualizing male development and the dilemmas of men in therapy, while providing exemplars of the wide range of clinical work this perspective enriches. Chapters concisely summarize the major benefits and limitations of conventional approaches to treating men and provide beginning conceptualizations of treatment issues with men that are grounded in social theory, sensitivity to power issues and the social context, and shifting cultural definitions of masculinity, femininity, and the nature of marriage. Other chapters employ the exciting and germane concepts of social constructionism to analyze belief systems about men and how cultural ideals shape and limit the personal development of men. An ideal resource for all therapists striving for excellence in treating men. Treating the Absent Man: Is It Possible? Is It Ethical?